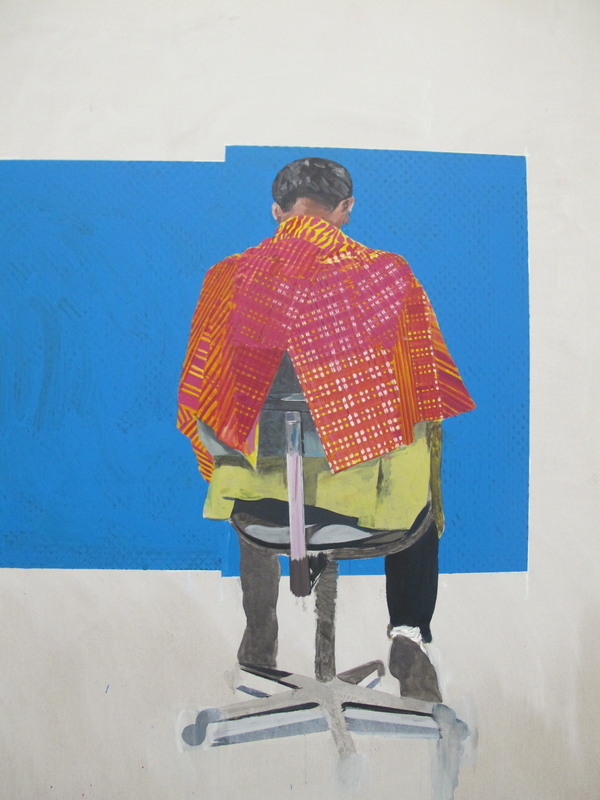 Reporting Back is the title of an exhibition by Birmingham born artist Hurvin Anderson exploring themes of personal and cultural history, memory and alienation. These complex themes are examined through the medium of paint as only a painter knows how. Expanses of pure colour jostle against geometric patterns, imparting the paintings with an immediacy and vividness that play on our notions of Caribbean geography and culture. Yet the bold, fragmented and frequently abstracted forms distance memories from any hint of sentiment; the joyous colours belie a recurring sense of insecurity and alienation. The Welcome Series exemplifies this: we have to look through and beyond decorative grilles to reach the leisure fun spots. In these works our view is subtly obscured by chicken wire or gates that give us a tantalising taste of a desirable destination such as a cafe or tennis court. We think we can see it, but the barrier remains and the viewer is not in the place of interest but just outside it, watching. Although this sophisticated interplay is set in the Caribbean and not Britain, to my mind, the grille imagery symbolises the plight of migrant workers invited to Britain to fulfill labour shortages who nonetheless faced prejudice and discrimination; “you are welcome, but must go no further”. However, it could also symbolise socio-economic barriers and territorial battles that transcend both cultures where the rich hold the poor at bay regardless of where either are from. The Peter Series depicts the barbershop attic retreat of an Englishman named Peter. Here a delicious blue interior sets the scene of vulnerability and a process of transformation, the haircut. The sitter has his back to us. On the face of it, the viewer is in the most powerful position. The mood is contemplative with no genuine menace and the artist’s past or present feelings about the experience of that space remain illusive. Such is the enigma that is Hurvin Anderson an artist who deftly takes you on a journey through his memory, presenting tense scenes whilst giving very little of his own emotions away. He is the critical and beguiling watcher and presenter of deceptive beauty whether in Trinidad, Jamaica or Birmingham. Reporting Back at the Ikon gallery (25 September – 10 November 2013).